It consist of a spacious room, kitchenette and a bathroom equipped with bathtub (combined with shower). Please note: As this flat is in the strict centre of Krakow, on a Saturday nights the noise from local pubs might occure!!! Little things are provided in the flat, such as a hairdryer, an international plug adaptor, umbrella. The flat is situated in tenement house in the right heart of Kazimierz. The apartment is located in Kazimierz the Jewish Quarter of Krakow . A small town in a big city, Kazimierz owes its unique atmosphere to the historical neighbourhood and has many interesting attractions: galleries, antique shops, restaurants, original bars and pubs. 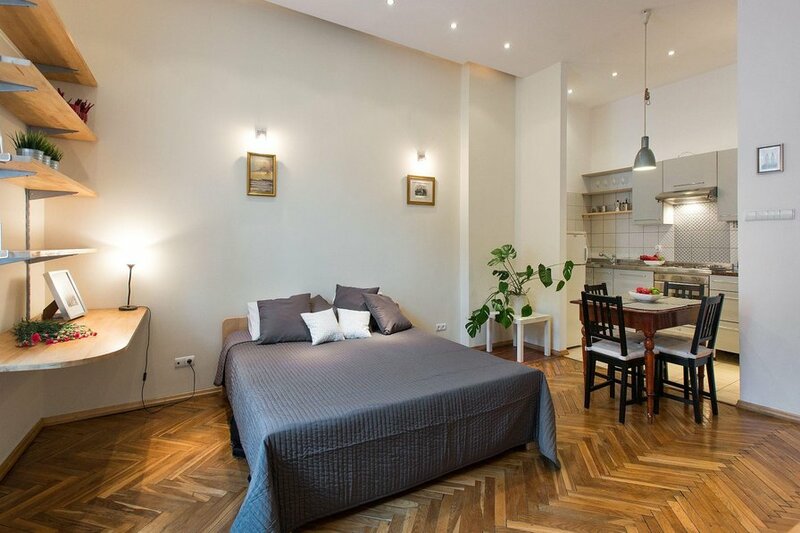 For those who are interested in visiting historic monuments, museums, galleries, medieval and baroque churches and synagogues, our apartment is a perfect starting point.